On March 19, 2011, we had a so-called "super full moon" — a full moon about an hour before perigee which was reportedly the largest apparent diameter full moon in nearly two decades. I took a trip to Carranza Field to watch and photograph this moon as it rose over the distant trees in the east, but in all frankness, it didn't look much different from any other full moon, and even the "moon illusion" seemed absent. The photos obtained were equally unremarkable (here's an example taken at 7:47 pm with an 80 mm, f/6 apo refractor at prime focus; cropped). Since I already had the camera out, I turned away from the moon and took snapshots of Orion in the southwest (Canis Major is at the lower left and the Hyades in Taurus are to the upper right). The trees below were softly illuminated by the light of the full moon. This single-frame image was obtained at 8:36 pm, 67 minutes after moonrise (Canon 40D, Sigma 18-50 mm f/2.8 zoom lens at 18 mm; exposed 10 seconds at f/4, ISO 1600, on a fixed tripod; in-camera noise reduction and custom white balance, but no post-processing). Click the image for a larger version. Around 7:15 pm, Mercury and Jupiter were spotted in the western twilight after sunset, and by time I left around 9 pm, Saturn was above the tree tops in the east. 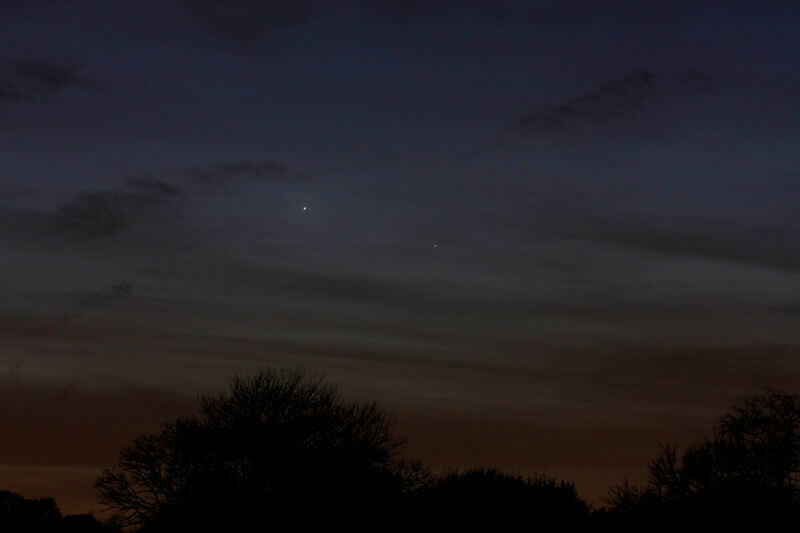 On March 13, 2011, the bright planet Jupiter served as a handy guide to find the elusive planet Mercury in the western twilight from Maple Shade, NJ. Mercury is about 5 degrees altitude and 3.5 degrees from Jupiter at the 4:30 o'clock position. Both objects were readily visible to the unaided eye when this picture was taken at 7:50 pm EDT, 45 minutes after sunset. Captured with a Canon 40D digital SLR camera and a Canon 70-200 mm f/2.8L zoom lens (on a fixed tripod) set to 100 mm focal length. It was exposed 0.6 seconds at f/4, ISO 400, using tungsten white balance. Except for size reduction, no processing was applied. Click the image for a larger version. On February 16, 2011, two distinct sunspot groups were present on the sun, 1161 towards the upper left and 1158 towards the lower right. During the protracted solar minimum we just experienced, such sunspots have been rare in recent years. This image was captured at 11:48 am EST using an 80 mm f/6 apo refractor equipped with a white-light solar filter and a Canon 40D digital SLR (with a photographic doubler for an effective focal length of 960 mm at f/12). This single frame was exposed 1/400 second at ISO 400 on a fixed tripod. Except for size reduction, no processing was applied. Click the image for a larger version. On the morning of February 11, 2011, our beloved dog Holly passed away. She had been our faithful companion since December 1, 1996, when she was just 2 months old. Holly will be greatly missed. New moon was at 9:31 pm EST on February 2, 2011, so the crescent moon was just 20 hr 23 min old at 5:54 pm on February 3, 2011, when this image was captured at the baseball fields in Maple Shade, NJ. The crescent was initially sighted at 5:32 pm with 16x70 binoculars when it was 20 hr 01 min old (my personal record for young moon spotting, but just short of breaking the 20 hr barrier). It was subsequently glimpsed without optical aid. This picture was taken with a Canon 40D digital SLR camera and a Canon 70-200 mm f/2.8L zoom lens (set to 200 mm focal length) on a fixed tripod. Exposed 1/40 sec at f/2.8, ISO 400, auto white balance. Except for resizing and cropping, no processing was applied. If you can't find the slender crescent, move your mouse cursor over the image for a cropped close-up of the lunar area. At sunset for observers near 40 degrees north, 75 degrees west (greater Philadelphia), the crescent moon will be 26.2 hours old on March 5, 2011 (update, 3/05: the crescent was spotted at 6:18 pm EST [26 hr 32 min old] with 10x42 binoculars, then subsequently glimpsed naked eye) and 32.9 hours old on April 4 (update, 4/04: the crescent was spotted naked eye at 8:08 pm EDT [33 hr 36 min old] with little difficulty). On May 3, it will be a mere 17.1 hours old at sunset (update, 5/03: clouds along the western horizon precluded any realistic chance of seeing this crescent). The springtime tilt of the ecliptic in the west after sunset and the moon's northerly ecliptic latitude on these dates result in most of the moon's solar elongation being perpendicular to the horizon, which maximizes lunar altitude at sunset, a circumstance favorable to young moon spotting. Brilliant Venus (in the lower-left corner) and the crescent moon were a splendid pair, just 9 degrees apart, at 5:51 am EST on January 29, 2011. Although the constellation Scorpius is prominent to the right of the pair, both Venus and the moon are in Ophiuchus, the Serpent Bearer, which recently made the news as the "thirteenth constellation of the zodiac." Move your mouse cursor over the image to see a Stellarium clip; the dashed lines are the constellation boundaries and the reddish diagonal line is the ecliptic. The first-magnitude star Antares, the Heart of the Scorpion, is in the middle of the nearly vertical row of three stars 6 degrees to the right of the moon and the head of Scorpius is a diagonal row of three stars in the upper-right corner. The image was captured from Maple Shade, NJ, with a Canon 40D digital SLR camera on a fixed tripod and a Sigma 18-50 mm f/2.8 zoom lens set to 50 mm focal length. Exposed 1 second at f/4, ISO 800, using tungsten color balance. Besides size reduction, no processing was applied. Click here for a larger version. Click here for a wider field view (same exposure, but 31 mm focal length). Here's a view of the Main Conservatory at 4:55 pm EST (just after sunset) on January 2, 2011, during the Longwood Gardens Christmas display. The sky is beginning to clear along the western horizon behind the Conservatory while heavy clouds remain overhead. Taken with a Canon 40D digital SLR and a Sigma 18-50 mm, f/2.8 zoom lens at 18 mm focal length. Exposed 1/30 second (handheld) at f/2.8, ISO 800. Auto exposure with -1/3 stop bias and auto white balance. Click the image for a larger version. On the morning of December 2, 2010, brilliant Venus and the Crescent Moon (with earthshine) formed a lovely pair 7¼° apart low in the southeast at the onset of astronomical twilight. This image was captured at 5:30 am EST from Maple Shade, NJ, using a Canon 40D digital SLR camera on a fixed tripod and a Sigma 18-50 mm f/2.8 zoom lens set to 50 mm focal length. It was exposed for 1 second at f/4, ISO 1600, using tungsten white balance. Moving vertically from the Moon, the first object is Spica (Alpha Virginis), the next is the planet Saturn and then Porrima (Gamma Virginis) is near the top of the frame. 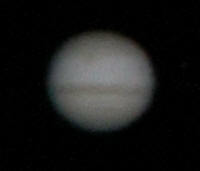 I was observing Jupiter on the morning of August 28, 2010, from my home in Maple Shade, NJ. Sky & Telescope's online utilities indicated the Great Red Spot would transit the Jovian central meridian at 12:48 am EDT and that the shadow of Jovian satellite Europa would begin a transit of the disc at 12:58 am. Later, at 2:16 am, Europa itself would begin a transit. All of these events were observed with my 12.5-inch Dobsonian telescope (pictured below), mainly at 160x (10 mm Tele-Vue Radian eyepiece) and 212x (7.5 mm Orion Ultrascopic eyepiece). Inspired by a fellow member of the Rittenhouse Astronomical Society, I also decided to try afocal imaging with my Canon 40D digital SLR camera (i.e., taking the picture by holding the camera up to the eyepiece in place of one's eye). Here's the result, a single-frame image taken with the 10 mm eyepiece at 1:19 am EDT. It was exposed using a manual setting of 1/500 second at ISO 1600, with automatic white balance, through a Sigma 30 mm f/1.4 lens set to f/2. Subsequently, it was cropped, noise reduction applied and brightness adjusted in Corel Paint Shop Pro. It has the same orientation as seen in the eyepiece, south is up and east is to the right. The Northern Equatorial Belt is self-evident horizontally below the middle, the Southern Equatorial Belt is conspicuous by it's absence and the Great Red Spot is a blotch above-left of center. A slightly darkened spot near the eastern limb above the NEB corresponds with Europa's shadow. 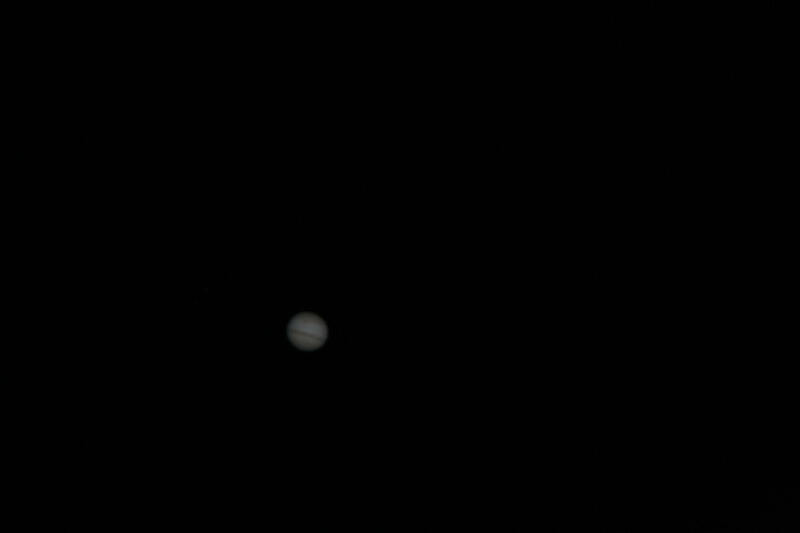 This certainly isn't a very good image of Jupiter (a web cam delivering hundreds of frames for stacking is a much better method), but it is interesting to see what can be accomplished with a very simple effort. Note that after cropping, it's only about 1/10 the dimensions of the original DSLR frame (or about 1/100 of the frame's area). For comparison, here are a couple of high-quality images taken by Efrain Morales in Puerto Rico at nearly the same time. Morales' image on the left, the color image, was captured just several minutes earlier than mine (at 05:16 UT on 28-August-2010). It has the same orientation, and in addition, it shows Europa to the right of the disc. Here's my 12.5-inch, f/5 Dobsonian telescope set up and ready to go near sunset on July 5, 2010, at Coyle Field in the New Jersey Pinelands. This is my "grab-and-go" scope that operates entirely in a manual mode; the only electricity used is a button cell for the Rigel finder. Nevertheless, object acquisition is rapid using the geometric method. This image was taken with a Canon 40D digital SLR camera using a Sigma 18-50 mm, f/2.8 zoom lens set to 18 mm focal length. Exposed 1/160 second at f/6.3, ISO 400, automatic color balance. Notice the Girdle of Venus in the background above the distant horizon. On the evening of April 28, 2010, Venus was about 3½ months past superior conjunction and had become a prominently bright object in the western twilight after sunset. Venus is so bright, it can be revealed with a simple hand-held snapshot (it's just below center). This image was captured at 8:22 pm EDT, 30 minutes after sunset in Maple Shade, NJ, using a Canon 40D digital SLR camera with a Sigma 18-50 mm zoom lens set to 50 mm focal length. Exposed 1/40 second at f/2.8, ISO 1600, daylight color balance. Other than size reduction for this web page, no processing has been applied. At 9:25 pm EDT on April 18, 2010, the moon was a crescent about 4.5 days old and 20% illuminated. 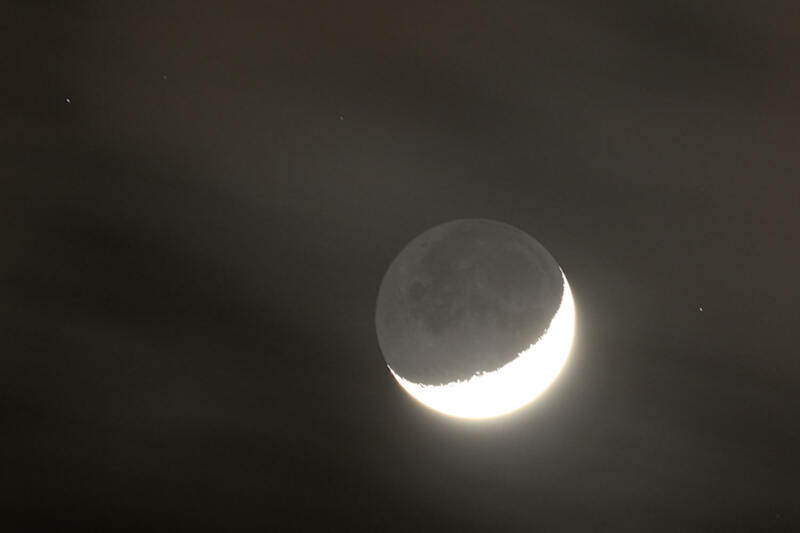 The remaining 80% of the moon was illuminated with ghostly earthshine. The former has been greatly overexposed to show the latter, and as a result, passing clouds were streaked. This image was captured with a Canon 40D digital SLR camera and an 80 mm, f/6 Megrez triplet apochromatic refractor on a fixed tripod. Exposed 2 seconds at ISO 400. The brighter stars in the frame are 118 Tauri to the right of the moon and 121 Tauri in the upper-left corner. At the time, the moon was roughly midway between Beta and Zeta Tauri, the horn tips of Taurus the Bull. At 5:23 am EDT on April 6, 2010, the International Space Station, coupled with the Space Shuttle Discovery (STS-131), passed a quarter degree above the crescent moon (a day past third-quarter) as viewed from Maple Shade, NJ. It was 1:39 after they docked at 3:44 am, so we just missed a double pass (the ISS and the Shuttle as separate objects). This cropped image was captured with a Canon 40D digital SLR camera with a Canon 70 to 200 mm f/2.8 lens set at 135 mm focal length; exposed 1/8 second at f/4, ISO 400 on a fixed tripod (the moon was overexposed a bit to ensure the spacecraft was recorded). It is one of forty full frames used to create an animation (about 395 KB). The Solar System's inner pair of planets have an apparent separation of 3 degrees at 8:16 pm EDT on April 4, 2010. Brilliant Venus (magnitude -3.9) is on the left, and dimmer Mercury (magnitude -0.5) is on the right. Both planets were recently at superior conjunction (Venus on January 11, 2010 and Mercury on March 14, 2010) and have yet to reach greatest eastern elongation (Venus on August 19, 2010 and Mercury on April 8, 2010). At the time the picture was taken, Venus was 1.6 AU away and Mercury was 1.0 AU away. This image was captured from Maple Shade, NJ, with a Canon EOS 40D digital SLR camera with a Canon 70-200 mm f/2.8 zoom lens on a fixed tripod set to 70 mm focal length. Exposed 1 second at f/4, ISO 400, daylight color balance was set manually. The pair was imaged again at 8:28 pm EDT on April 6, 2010, using the same setup; 2.5 seconds at f/4, custom color balance. Along the right-hand edge of the image, the primary stars of the constellation Aries are visible (Hamal above and Sharatan below). 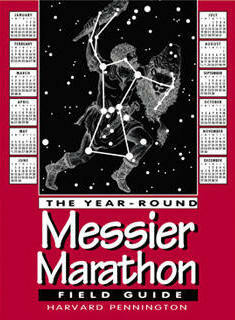 Astronomically, March is the best time of the year for the Messier Marathon (although weather can be a problem). For 2010, new moon was on Monday, March 15th at 5:01 pm EDT. Since the weather forecast was excellent for Wednesday night, March 17-18th, I made a Marathon run at Coyle Field in New Jersey. A total of 103 Messier objects were found along with two comets; here's a tabulation (38 KB PDF). Charles Messier was the 18th century "ferret of comets" who initially compiled the catalog which now totals about 110 objects (some final additions were made by 20th century researchers, and there's some contention regarding the inclusion of M102 and M110). Ironically, Messier's intention was to avoid these now-treasured objects, which were a distraction from the pursuit of new comets. I've also prepared a blank log sheet (58 KB PDF) based on Harvard Pennington's sequence from his book, The Year-Round Messier Marathon Field Guide, which is not only an excellent primer on the Messier Marathon itself but also on the use of the geometric method for finding the objects. It can be useful any time of the year, and ultimately, the method can be applied to any celestial object. At 4:14 am EST on February 8, 2010, the Space Shuttle Endeavour launched from Kennedy Space Center in Florida as mission STS-130. Seven minutes later, it appeared in the sky from Maple Shade, NJ... due south through the trees behind the brightly-lit building in the bottom-right corner of the frame. When this image was taken at 4:22 am, the Shuttle was over the house in the bottom left. To the unaided eye, the rocket-propelled Shuttle resembled Mars, but in binoculars, the orange, fan-like plume of the main engines was visible. Above the Shuttle (at the 11 o'clock position), are the three stars marking the head of the Scorpion (Beta, Delta and Pi Scorpii). The 2nd magnitude star Menkent (Theta Centauri) is vertically centered, a quarter of the frame from the right; it was 14° altitude at the time. Taken with a Canon 40D digital SLR camera (mounted on a fixed tripod) and a Sigma 30 mm f/1.4 lens. Exposed 1/8 second at f/2.0, ISO 1600. Click the image for a thirty-two frame animation covering 15 seconds of the pass in real time (cropped from the bottom-left corner; about 1 MB). At 4:17 am EST on January 31, 2010, Mars was just a day and a half past opposition. 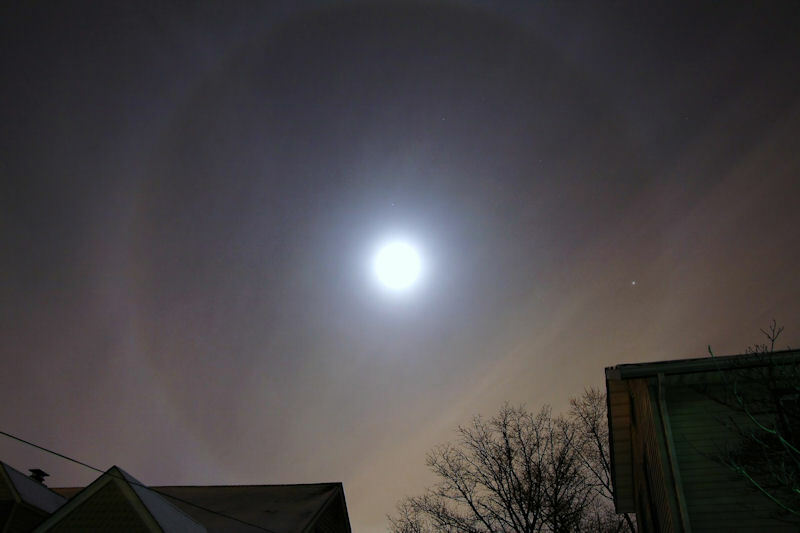 In this picture, it lies 19¾° to the right of the brilliant moon and just inside the 22° atmospheric halo around the moon. The moon itself is just a day past opposition (better known as "Full Moon") and is greatly overexposed here, but that allows us to see faint colors in the halo that were not apparent to the unaided eye at the time. Regulus, the Alpha star of the constellation of Leo (the Lion) lies 5° above the moon, and Algieba in the "Sickle" of Leo's head is 13° above the moon at the one o'clock position. This image was captured from the front yard of my home in Maple Shade, NJ, with a Canon 40D digital SLR camera (on a fixed tripod) and a Sigma 18-50 mm f/2.8 zoom lens set to 18 mm focal length. Exposed 2 seconds at f/4.5, ISO 400. Some modest adjustments were made to the brightness, contrast and color balance. Click the picture for a larger version (about 130K). The mighty planet Jupiter is accompanied by the four Galilean moons on Tuesday morning, September 30, 2009, at 12:30 am EDT. From the 11 o'clock position, they are Ganymede (4.5), Io (5.0), Europa (5.3) and Callisto (5.6). The parenthetical values are the magnitudes, which compare to Jupiter itself at magnitude -2.7 (this is more than 830 times as bright as the brightest Galilean moon, Ganymede). The line of moons spans about 13 arc minutes. The object on the left-hand side of the frame is the star Iota Capricorni, 28 arc minutes from Jupiter and visible to the naked eye at magnitude 4.3. Were they not so close to the brilliant glare of Jupiter, the Galilean moons would also be naked eye objects. Note that Io is quite close to Europa and would partially occult it at 1:44 am. This image was captured with a Canon 40D digital SLR camera at the 480 mm prime focus of a William Optics 80 mm f/6 Megrez apochromatic refractor on a fixed tripod. Exposed 1/4 second at ISO 800. It's cropped to about 44% of the original frame. Brightness and contrast were mildly adjusted and the relatively colorless image was converted to a grayscale. After a long "drought," a couple of decent-sized sunspots appeared. Here we see sunspot group 1024 at 10:37 am EDT on July 8, 2009, imaged with a Canon 40D digital SLR and a Kenko doubler attached to a William Optics 80 mm f/6 Megrez apochromatic refractor (yielding an effective focal length of 960 mm at f/12). The scope was mounted on a fixed tripod and it was equipped with an Orion metalized glass visual solar filter. Exposed 1/800 second, ISO 800, using auto white balance. The image was converted to a grayscale and curve-adjusted in Paint Shop Pro then cropped. In this view, the sun's equator (and direction of solar rotation) runs from about the seven o'clock position to the one o'clock position, so the sunspots soon disappeared at the upper right limb. The "Lunar X" reached a favorable position on March 3, 2009 when this picture was taken on at 6:26 pm EST from Maple Shade, NJ, with a Canon 40D digital SLR at the prime focus of a William Optics 80 mm, f/6 apochromatic refractor on a fixed tripod. Manually exposed 1/320 second at ISO 400 with daylight white balance, then cropped. The "X" is an temporary illumination effect when the rims of craters Blanchinus, La Caille and Purbach catch the rising sun while the floor below them remains in darkness. Read more about the Lunar "X" here (642K PDF). Move your mouse cursor over the image to highlight the "X." A close-up of the feature cropped from the image above. On January 31, 2008, the great globular cluster Omega Centauri was observed and photographed from East Point, NJ, on the north shore of the Delaware Bay. A good southern horizon is necessary since Omega's declination of 47.5 degrees south means it reaches an altitude of little more than 3 degrees when it transits the meridian at East Point (latitude 39.2 degrees north). This picture was taken at 5:15 am EST with a Canon 40D digital SLR camera and a Canon 70-200 mm f/2.8 zoom lens set to 70 mm focal length. It was exposed for 13 seconds at f/2.8, ISO 1000, on a fixed tripod. Move your mouse cursor over the image to highlight Omega.